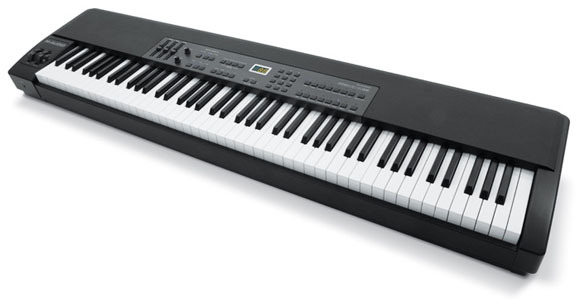 Several sites are reporting that M-Audio has introduced a new 88-key stage piano, but it’s not new: in fact, Ken “King of Keys Hardware” Hughes from Keyboard Magazine has a great review of the ProKeys88 from Keyboard’s July issue. Ken’s verdict: a great keyboard, an incredible price (street around US$600 from what I can see), and he likes the sound. (There is one clunky EP sound, and the keyboard is still rather large.) If you don’t want the sound, M-Audio also makes the USB/MIDI Keystation Pro 88 controller. Same keyboard action on both. I’m still fond of my old Alesis QS-8 as a full-size controller, though I wish it were more portable. More reason QS-8s have a different action that I don’t like nearly is much; you can probably get a good deal on the Alesis used. What’s your favorite full-sized, piano-action keyboard? Let us know. We’ve got all these new piano samples to play, after all.